Besides playing Blu-ray/DVD discs, you can also enjoy video, audio and image files on your Samsung Blu-ray Player from USB or DLNA devices. This article below will show you the chart for Samsung TV supported file formats and give some additional tips when you fialed to play an unsupported video file on Samsung Blu-ray Player. 1. Even when the file is encoded by a supported codec listed above, a file might not be played if its content has a problem. 2. Normal playback is not guaranteed if the file's container information is wrong or the file itself is corrupted. 3. Files having higher Bit rate/frame rate than indicated in the table above may stutter when played back. 4. Seek (Jump) function is not available if the file's index table is damaged. 5. When a file is played back remotely through a network connection, video playback may stutter depending on the network speed. 6. Some USB/Digital camera devices may not be compatible with the product. 2. Does not support VC1/AP/L4. 3. CODECs except for WMVv7, v8, MSMPEG4 v3, MVC, VP6. If below 1280 x 720: 60 frames max; if above: 30 frames max. 4. Does not support GMC 2 or higher. 5. Supports SVAF (Top/Bottom, Side by Side). 6. Supports BD MVC Spec. 1. Supports WMA 10 PRO (Up to 5.1). 2. Does not support WMA lossless audio. 4. Does not support ADPCM(A-Law, μ-Law). 5. Does not support QCELP/AMR NB/WB. 6. Supports vorbis (Up to 2ch). Note: Some DivX, MKV, and MP4 format discs may not play, depending on their video resolution and frame rate. The supported subtitle should have the same title with the video. Supports WMA 10 Pro (Up to 5.1). 1. The product can play back AVCHD format discs. These discs are normally recorded and used in camcorders. 2. The AVCHD format is a high definition digital video camera format. 3. The MPEG-4 AVC/H.264 format compresses images with greater efficiency than the conventional image compressing format. 4. Some AVCHD discs use the "x.v.Color" format. This product can play back AVCHD discs that use "x.v.Color" format. 5. "x.v.Color" is a trademark of Sony Corporation. 6. "AVCHD" and the AVCHD logo are trademarks of Matsushita Electronic Industrial Co., Ltd. and Sony Corporation. Note: Some AVCHD format discs may not play, depending on the recording condition. AVCHD format discs need to be finalized. "x.v.Color" offers a wider colour range than normal DVD. 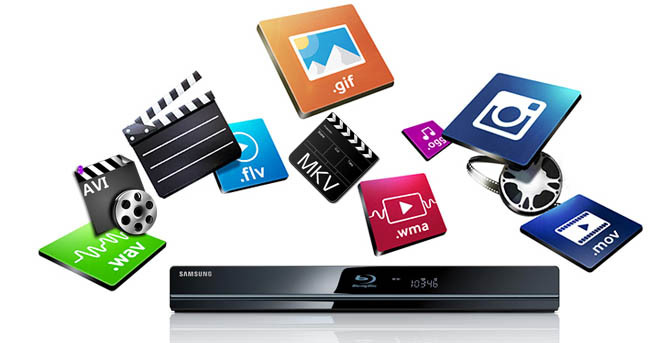 Additional Tips: What if you fail to play a video file on Samsung Blu-ray Player? Although Samsung claims that the Blu-ray Player supported most video file formats, you still will encounter problems when playing an common-used MKV, AVI, MP4, MOV, etc. video files on Samsung Blu-ray Player. So what's the matter? The reason is that MKV, AVI, MP4 or MP4 are format containers with difference codecs. Your video file codec isn't compatible with Samsung Blu-ray Player. To easily solve the problem, a widely recommended solution is to convert the videos to Samsung Blu-ray Player friendly movie formats. Actually, it's very easy as long as you have a professional all-in-one video converter for Samsung Blu-ray Player. EaseFab Video Converter Ultimate (available for Windows and Mac users) is such a smart tool for you. Even through you don't know what audio codec in your MKV, AVI, MP4, MOV, etc, files is best for Samsung Blu-ray Player, this app can let you convert your video files to a full compatible format for Samsung Blu-ray Player just with one click. Then, the entire conversion process will take you a few minutes. After that, you can watch the unsupported movies on Samsung Blu-ray Player. Besides encoding/recoding almost popular video files, EaseFab Video Converter Ultimate can also rip, convert and backup your Blu-ray and DVD discs. You can use it to remove unmatched region codes from Blu-ray/DVD so that you can enjoy your Blu-ray and DVD discs without the limitation of region codes. Just have a try. Step 1: Run EaseFab Video Converter Ultimate and load source media files to the software. Step 2: Select MP4 format (Profile > Common Video > MP4 Video) from the common video choices only for description purposes.